One of the New York Times 10 Best Books of 2009-- now adapted into the feature film Certain Women, starring Kristen Stewart-- award-winning writer Maile Meloy's short stories explore complex lives in an austere landscape with the clear-sightedness that first endeared her to readers. Don't miss her new novel, Do Not Become Alarmed. Meloy's first return to short stories since her critically acclaimed debut, Both Ways Is the Only Way I Want It is an extraordinary new work from one of the most promising writers of the last decade. Eleven unforgettable new stories demonstrate the emotional power and the clean, assured style that have earned Meloy praise from critics and devotion from readers. Propelled by a terrific instinct for storytelling, and concerned with the convolutions of modern love and the importance of place, this collection is about the battlefields-and fields of victory-that exist in seemingly harmless spaces, in kitchens and living rooms and cars. Set mostly in the American West, the stories feature small-town lawyers, ranchers, doctors, parents, and children, and explore the moral quandaries of love, family, and friendship. A ranch hand falls for a recent law school graduate who appears unexpectedly- and reluctantly-in his remote Montana town. A young father opens his door to find his dead grandmother standing on the front step. Two women weigh love and betrayal during an early snow. Throughout the book, Meloy examines the tensions between having and wanting, as her characters try to keep hold of opposing forces in their lives: innocence and experience, risk and stability, fidelity and desire. 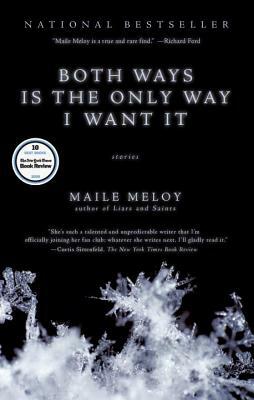 Knowing, sly, and bittersweet, Both Ways Is the Only Way I Want It confirms Maile Meloy's singular literary talent. Her lean, controlled prose, full of insight and unexpected poignancy, is the perfect complement to her powerfully moving storytelling. Maile Meloy is the author of the story collection Half in Love, and the novels Liars and Saints, shortlisted for the 2005 Orange Prize, and A Family Daughter. Meloy’s stories have been published in The New Yorker, and she has received The Paris Review’s Aga Khan Prize for Fiction, the PEN/Malamud Award, the Rosenthal Foundation Award, and a Guggenheim Fellowship. In 2007, she was chosen as one of Granta’s Best American Novelists under 35. THer short stories were adapted into the 2016 film, Certain Women, starring Kristen Stewart and Michelle Williams. She lives in California. "Though it might seem strange to praise a writer for the things she doesn't do, what really sets Meloy apart is her restraint. She is impressively concise, disciplined in length and scope. And she's balanced in her approach to character, neither blinded by love for her creations, nor abusive toward them. . . . She's such a talented and unpredictable writer that I'm officially joining her fan club; whatever she writes next, I'll gladly read it." "After two well-received novels, Meloy returns to the short story, the form in which she made her notable debut and to which her lucid style is arrestingly well suited. Many of these stories are set in Meloy's native Montana, and all are about domestic distress-about love, mostly, and the trouble stirred up by its often inconvenient insistence. Several are poised in the limbo of adultery, in the time between act and confession. Always true to her wide-ranging though consistently introspective characters, Meloy convincingly depicts the inchoate emotion that drives people, while also distilling meaning from it." "If life is all about choices, as the saying goes, then what happens when we simply can't make up our minds about what's most important? In her second volume of short stories, Both Ways Is the Only Way I Want It acclaimed; novelist Maile Meloy (Liars and Saints, A Family Daughter), who first stunned critics in 2002 with her debut story collection, Half in Love, cracks at our nagging desire to have it all (the answers, the romance, the payout, and, in one case, the late grandmother come back to life) in 11 tightly written, remarkably fluid narratives, most of which unfold in sleepy towns across Meloy's native Montana."